Becoming a Magician is one of the most exhilarating skills you can learn. Having the ability to create illusions that excite and astound your audience gives you an aura of mystery that is unmatched in any other type of performance. If you are interested in learning magic there are a few basic places you need to start. First you have to obtain a deck of cards and work through some basic magic tricks that involve counting and card positioning. 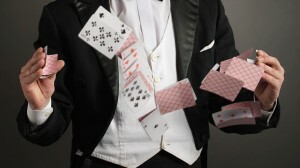 Card tricks are the cornerstone of a Magician’s skills, you must always carry a deck of cards with you wherever you go so you can practice your tricks over and over again with new audiences and in difference locations. The Ultimate 4 Card Trick is a great trick to start with, it is simple and is designed to amaze even the most skeptical audience. Once you have mastered these basic Card Tricks and skills you will be able to start working on your sleight of hand. There is an excellent 4 DVD set which includes everything from Basic card tricks through to the more advanced Sleight of hand and we highly recommend it for anyone who is interested in becoming a Magician. The DVD’s include over 120 effects and is a complete course that will move you from a beginner to expert level card magic. You will learn the great sleights of hand, controls, and flourishes of a proficient card technician. 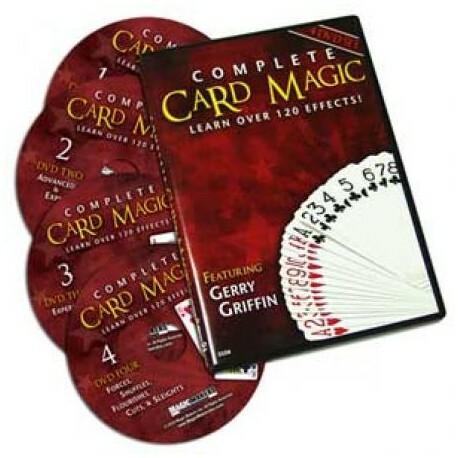 Highly respected magic instructor, Gerry Griffin, will take you step-by-step through your entire journey into card magic. Just these three learning DVD’s will be enough to make you stand out from the rest of the Magicians you meet as most people do not commit the time or the energy it needs to truly become a wonderful magician. Do yourself a favour, invest in yourself and you will be rewarded with a lifetime of skills that you can use whenever or wherever you go.